Our range of products include injection grouting machine, manual injection grouting pump, pu resin grouting pump, pu epoxy grout pump, epoxy injection grouting pump and dual component injection grouting pump. 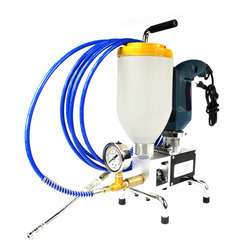 SEE-3000 is a Professional Injection Pump electronic drill powered and designed specially for easy and fast Injection of synthetic resin to the concrete structures. Though being very compact and powerful, it develops pressure gradually up to 6000psi and is extremely light weight and easy to carry along even in basement or confined areas. Being detachable it is easy to maintain and cleaning can be done conveniently. This pump maintains even stable working pressure to give uniform grout delivery so even small cracks are filled neatly throughout line of grout injection area. So doing mid – size jobs daily with ease and reliability SEE-3000 is the Perfect Machine. We have carved a niche for ourselves as the leading suppliers and traders of premium quality Manual Injection Grouting Pump. These are supplied to clients through our efficient supply network. These pumps are operated using manual injection methods and are supplied to clients in a vast array of dimensions. These pumps are priced reasonably and are supplied to clients within the stipulated frame of time. We supply these to clients at affordable prices. 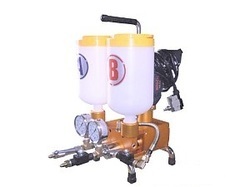 SE -100 injection hand pump is compact, user friendly and highly economical Equipment for applicator. Generating pressure up to 100 bars (1500 psi) it can pump epoxy resin and polyurethane very effectively. SE-100 injection Hand pump is mounted on a flexible folding stand making it suitable for small jobs in confined places. So doing small size jobs daily with ease and reliability SE-100 hand pump is the Perfect equipment. SE-100 injection hand pump comes with two versions single component alloy Body and stainless steel body , alloy body pump works with only epoxy resin And polyurethane whereas stainless steel body can inject cement in to the concrete. Powerful and lightweight injection pump for a wide range of injection grouts. Suitable for mid-size jobs and daily use. 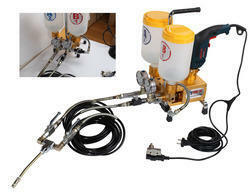 Perfect machine for waterproofing contractors when performing commercial work and residential injections. Compact but powerful. It can create pressures up to 10000 psi. We are a leading manufacturer ,supplier and trader of premium quality Single Component Injection grouting Pumps. These pumps are manufactured in stringent compliance with industrial quality standards and are known for their exceptional quality. These injections have single components and are known for being easy to use, durable and damage-resistant. These pumps are supplied to clients in a vast range of dimensions within the stipulated frame of time. Their quality is stringently tested by professional auditors prior to dispatch. SEE-250 is a Professional Injection Pump electronic drill powered and designed specially for easy and fast Injection of synthetic resin to the concrete structures. Though being very compact and powerful, it develops pressure gradually up to 4000psi and is extremely light weight and easy to carry along even in basement or confined areas. So doing mid size jobs daily with ease and reliability SEE-250 is the Perfect Machine. Different specifications of Dual Component Injection Grout Pump are supplied and traded by us through our efficient supply network. These pumps are known for their ease of installation and maintenance. These pumps are made available to clients through our efficient supply and trade network at affordable prices. These are known for being easy to install and maintain. These pumps are supplied to clients after being approved for their quality and efficiency by professional quality analysts. Looking for Injection Grouting Pumps ?